“Peace on earth and good will to men.” This is the season where we reflect on Christ’s offer and promise of His peace. But why do so few seem to have it? Why is it that some people rant over such things bad drivers and delayed appointments while others walk peacefully through life’s storms? I am not talking about the distinction between what we might call good people and those who are living lives that we wouldn’t characterize as “good.” I know plenty of decent people who really struggle with this idea of living in the peace of Christ. I am also not talking about folks who are “just fine” in their lives but who don’t necessarily inspire others to holiness or reflect the work of Christ. I am getting at an order of living where the presence of Christ is palpable in the person and where peace really does reign (for the most part) whether in calm or very troubled waters. 1. They live a sacramental life: They make time to frequently attend Mass and regularly go to confession. Many of them go to Adoration weekly. 2. They commit themselves to prayer no matter how busy they are: They all practice vocal prayer but then go a step beyond to a cultivation of a relationship with God through mental prayer and meditation. 3. They constantly engage in spiritual reading: This is not primarily an intellectual exercise but one where the content and the approach turn the heart and mind to God. 4. They give themselves to others: They frequently give their time, talent, and treasure to others. 5. They have a spiritual director: They understand that they need outside perspective and guidance to help them achieve all of the previously listed spiritual disciplines. Now you might be thinking that these folks must all be either religious or priests. This is not the case. I know both laypeople and religious who know this peace. If your experience is one that reflects an absence of peace, perhaps it’s not too early to think about a New Year’s resolution. To some even one of these practices might appear to be a huge hurdle. A journey of a thousand miles begins with a first step and a deeper spiritual life begins with doing the next thing, such as going to adoration, more Scripture reading, finding a spiritual director, or receiving the sacraments more often. It’s not a matter of adding everything all at once, but rather making a commitment to do more. Spiritual direction is a way to discern the next step. This past year, two of my friends began receiving spiritual direction. They’ve shared with me how it has helped them to dig deeper in their relationship with Christ. 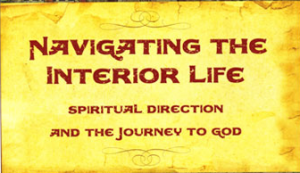 I too recently found a spiritual director and have also recently reviewed the book Navigation the Interior Life, Spiritual and the Journey to God by Dan Burke. I know of no better resource on this topic and highly recommend it as a guide to understanding spiritual direction. In the end, amid all the trappings of Christmas and culture, this season is about the Prince of Peace. The best way we can prepare for him is to cultivate more peace on our piece of the earth.